"If these whales are going to survive, we need to move quickly. Five years from now, it may be too late." SEATTLE -- A two-and-a-half-year-old male orca born in the so-called Baby Boom of 2015 died last week, researchers say. The Washington state-based Center for Whale Research says J52 (aka Sonic) was last spotted with his mother near the Strait of Juan de Fuca on September 15, 2017. A photo taken that day shows Sonic with a deadly condition called "peanut-head". Four days later when the J pod swam into Puget Sound, Sonic was not with the group. Researchers say Sonic likely died from malnutrition. His nursing ended more than a year ago, and his life was dependent upon salmon that have become in short supply this summer, the center says. Three of the six whales born in the J pod during the baby boom, which began in December 2014, have now died; and, two mothers (J14, J28) and a great-grandmother (J2) in the pod have also died. 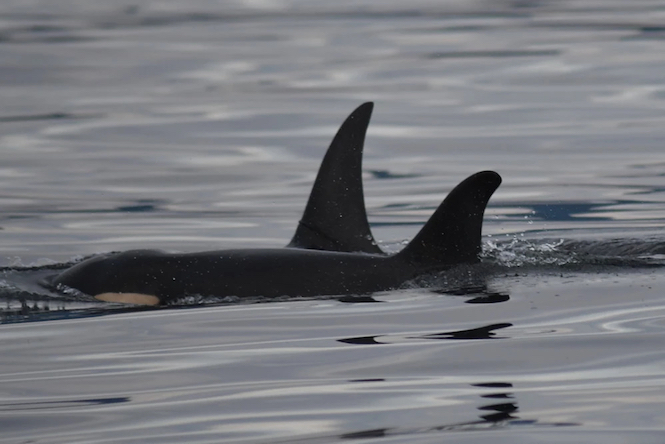 Researchers with the center say no southern resident killer whales from any of the pods have been born alive and survived in 2017, declaring the baby boom over. The population of critically endangered southern resident killer whales, which migrate along the West Coast, has dipped from 83 last year to only 76 whales today. This death represents the biggest decline from year-to-year ever recorded, according to researchers at the Center for Biological Diversity. "The death of another killer whale puts this iconic population on a dangerous path toward extinction," said researcher Catherine Kilduff. "If these whales are going to survive, we need to move quickly. Five years from now, it may be too late." The National Marine Fisheries Service singled out Southern Resident killer whales as one of eight species most at risk of extinction in its 2015 "Species in the Spotlight: Survive to Thrive" report to Congress.